Overview Addressing the needs of the modern gentleman, TOM FORD is committed to redefining luxury by employing expert Italian craftsmanship, fine materials and impeccable detailing. 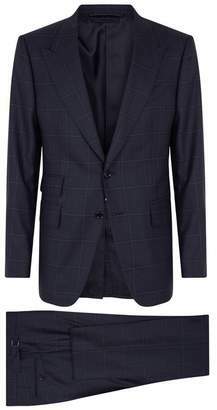 Exemplifying all three, this check version of the label's Shelton suit offers a clean-cut jacket in pure wool, with peak lapels and flap pockets. Matching trousers boast adjustable waist tabs to secure the perfect fit without the bulk of a belt.